An investigation in architecture through a series of fragments made by ways of questions, provocations, and constructs. The last four-plus decades have seen formidable developments in the discipline of architectural history/theory and at large — Architecture. This prolific production of theory found its mode of public dissemination in mediums such as Oppositions, Log and Assemblage among countless others. 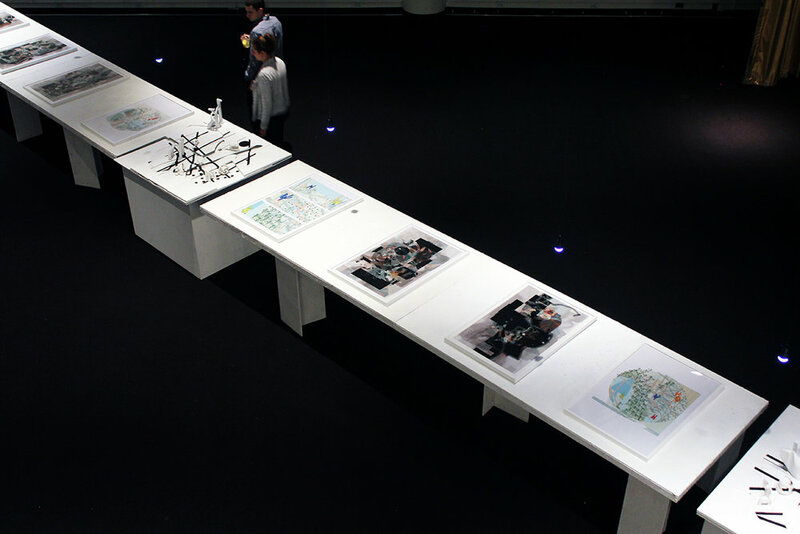 Theorist such as Diana Agrest, Stanford Anderson, Alan Colquhoun, Francesco Dal Co, Peter Eisenman, William Ellis, Kurt W. Forster, Kenneth Frampton, Mario Gandelsonas, Michael Hays, Giorgio Grassi, Fred Koetter, Rem Koolhaas, Léon Krier, Mary McLeod, Rafael Moneo, Joan Ockman, Martin Pawley, Aldo Rossi, Colin Rowe, Denise Scott Brown, Jorge Silvetti, Manfredo Tafuri, Bernard Tschumi and Anthony Vidler all participated in the production of a new disciplinary mode of communication, one that attempted to begin the cross breeding of Architecture with art, literary theory and attempt to connect with the general public. The origins of architecture’s disciplinary and representational bisections can simultaneously be traced be to the infusion of psychology and critical theory into Architecture’s reach. Through this reaching, architecture’s means of representational tendencies delineated into the text & image. We suddenly have no inclination of how and in what sense to move forward, why? We have instead, paused and exploded into a plethora of unrelated directions. Simultaneously, the scholars of architectural discourse, have found no foundation on which to attach their new words, endlessly attempting to pull from the graveyard of forged memories, manifestos scratching for a ray of light to peer upon their texts. Text, defined as content rather than physical form, and, image defined as a representation of external form then leaves Architecture with either text with nothing to shape or images with nothing to say. These modes of architectural communication have fostered a space of inquiry and disconnect between the scholarly text and design image. This differentiation is broken down into the usage of language, audience and mediums, nothing more. It is not a question of criticality, or relevance, it is not a question of meaning, it is a question of common meaning and interpretation. The text, the written portion, of ENDNOTES is the collection of images before you. The images before you, are a translation of the text into text, but a translation of the linguistic text, into the graphic text, the text one step removed from pure legibility as itself, and still teetering tension between image and text. Each graphical translation is a framed perspective to the semiotic object extracted from the larger whole and allowed to explore its lingering middle between language, image, and implicitly architectural convention. Conventions are architecture’s first language, its primary means of communication. The artifacts on display are the remnants of such in an investigation. They are a series of graphic translations which attempt to begin to represent an alternative perspective of Manfredo Tafuri’s ideas into an in-between of the text and image; only solidified through the spectator’s desire. There are nine large graphic translations, two material translations, six momentary glimpses into these translation’s constructed realities and one publication all presented in one installation. 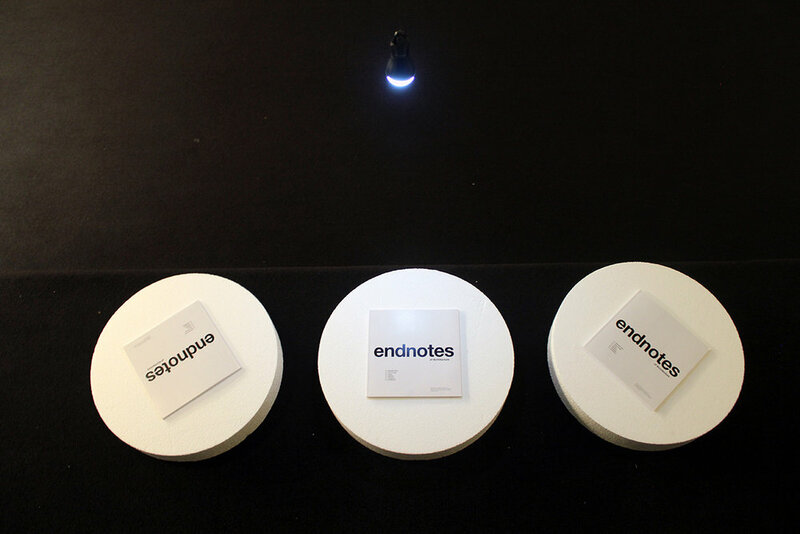 ENDNOTES looks not to answer questions, but to discover the potentiality of understanding all the tools at hand and the power of fragmenting even the most solidified of methods and presenting their outcomes.